Does your home have Low Water Pressure? Most homes at some time will experience low water pressure. Nothing is more frustrating than getting ready for a nice warm shower, undress, turn the tap to find the water only dribble out of the shower rose. Sometimes solving the low water pressure problem can be simple fix or you may need to call a licensed plumber. Keep reading and we will try to solve the problem for you. Are there any other taps throughout the home left running or do you have a badly leaking tap that needs repair. Check your hose taps and the hose if it is connected. If any of your taps are leaking, have them repaired and see if your low water pressure problem is fixed. Is the water pressure low in just one tap or single fixture? If yes, then the problem may be isolated to this fixture due to a blockage. If all these taps & hot water system are not leaking then move to our next step B. If your water meter is NOT moving, then move to step C.
Some homes throughout greater Brisbane and Gold Coast still have old galvanised water pipes or sections of old galvanised water pipe. To test if this is you, grab a clean clear glass. Fill the glass with cold tap water. Can you see any floating particles or is the water discoloured? Is there a slight taint of a rust colour? If you answered yes, then your pipes are deteriorating from the inside. If this is the case, then there may be enough rust build up to clog the pipes, or there may be a pipe that has deteriorated bad enough to have now have a hole/s which is now leaking. 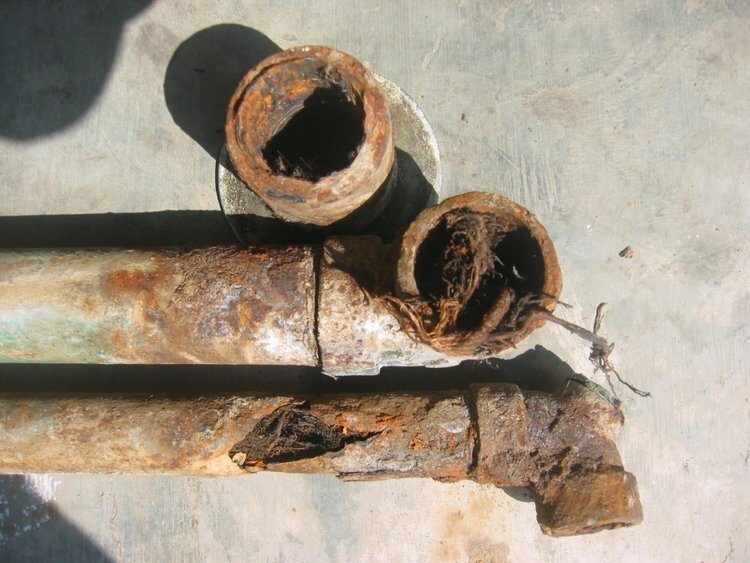 Corroded and leaking water pipes are a problem for a few reasons. A) If undetected, a leaking water pipe will cost you a fortune in excess water. B) A hole in the plumbing pipe may allow dirt & bacteria to enter into the water supply & C) the corrosion or small rust particles will get stuck in your taps, shower roses, toilet valves and hot water valves which will cause them to have poor water pressure or even leak. If you think this is the problem, then you will need to call a licensed plumber such as Moyle Plumbing to repair the pipes and look at your water pressure problem. If you still haven’t found the problem of your low water pressure, keep reading to step D.
The low water pressure problem, may not be a problem just to your home. Council could be working on a burst water pipe outside your home. If this is the case or if you’re unsure, a phone call to your local council will put your mind at ease. If they are working on the problem, then all you have to do is wait. Your low water pressure will be resolved soon. If you think you had the water to your home turned off in the past week or so for Council maintenance in your street, then you may have got some dirt or grit stuck in your plumbing fixtures. You will need to call a licensed plumber like Moyle Plumbing & Gas Fitting to inspect & repair. If it is proven that the problem was due to a Council burst, then you may be able to have your plumbers charges reimbursed by Council. If all the above tips have not resolved your low water pressure, you will need to get a plumber to inspect & repair. If you live in Logan, Brisbane South, Beenleigh or Northern Gold Coast suburbs, then Moyle Plumbing can repair your low water pressure problem at your earliest convenience.